I’ll bet that you have noticed that I post loads of recipes for sweet delicious baked goods on a regular basis… What you might not know is that I don’t eat any of them. They are all lovingly made for family and friends, but I stay away from them completely. You see, several years ago, I decided to give up eating carb laden goodies with lots of sugar. Oh, I still enjoy the sweet taste of sugar but I have found some great substitutes over the years. 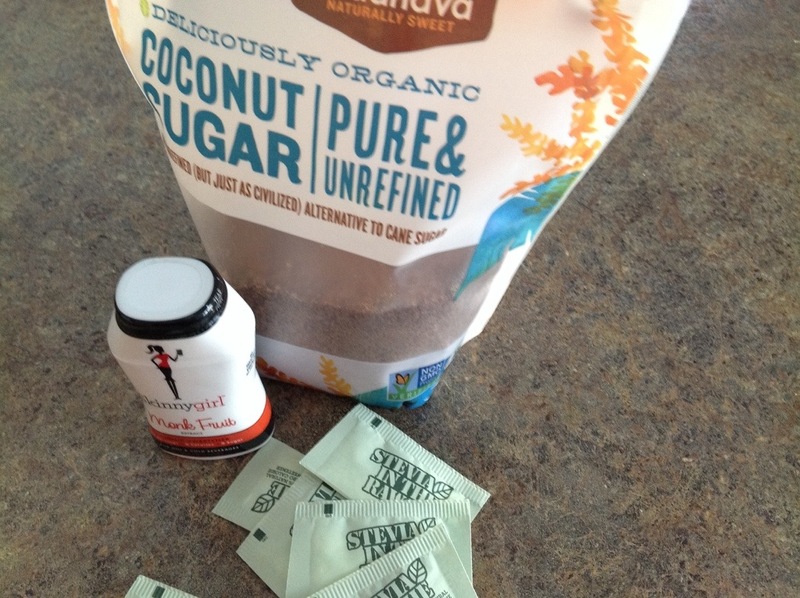 A few of my latest favorites are monk fruit extract, stevia in the raw, or coconut palm sugar. Sure, there is quite a bit of controversy circling artificial sweeteners, but these are the few I choose that seem to work for me. When I’m looking for something sweet, I engineer things for myself so that the carbs are low and the fiber content high. 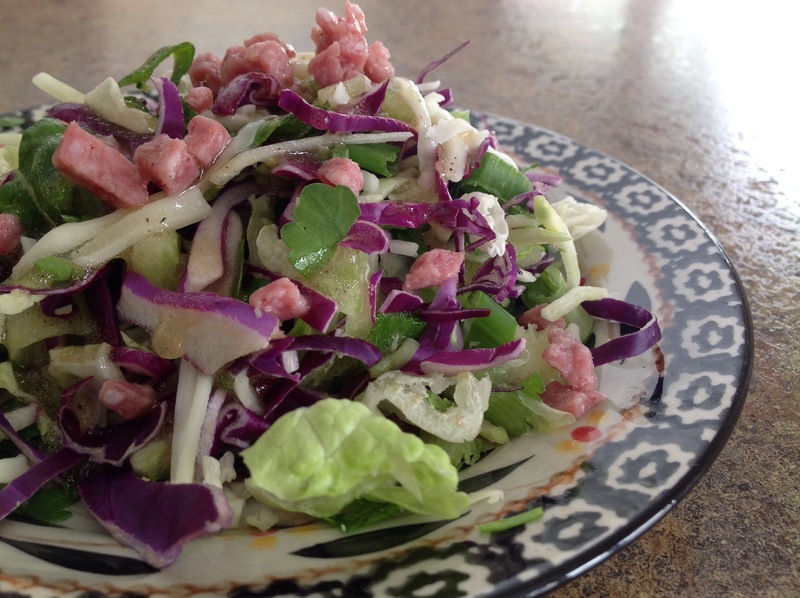 This salad recipe idea came to me after having a similar salad at a recent Christmas party. It was a carry-in party where my co-workers and I were asked to bring beverages, salads, side dishes and desserts. One of my co-workers brought in a fabulous pre-made salad that she bought at Cosco. There were 7 different greens, sunflower seeds, pepitas, and dried cranberries. A pre-made dressing was included. Everything delivered in a sizable package. Here’s the kicker…all for just $5.00. Well, I went back for seconds…and thirds on the salad. I raved about it all afternoon. It’s called the Sweet Kale Vegetable Salad Kit. It’s made from a blend of kale, broccoli, shaved Brussels sprouts, green cabbage and chicory. 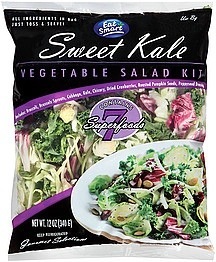 Seven “super greens” are blended within the salad to provide a wide variety of textures and flavors. One drawback here…is the dressing. My taste buds are highly sensitive to the sweet taste of sugar and I tasted a lot of it in the pre-made poppyseed dressing. The other drawback…I don’t live near or have a shopping card for Costco. So, I did the next best thing…I made my own salad. It’s a bit different because of the availability of some of the salad items in my grocery store. When I priced out the cost of purchasing all of the different “super greens” needed to make the salad, the bill really added up quickly. My next idea meant looking for salad blends that had been prepackaged to save a little “green”. I found a blend made with broccoli stalks, red cabbage, romaine lettuce, and green onion. I found another mix with mini kale and Brussels sprouts so I combined the two. Then, instead of the poppy seed dressing, I added my own sweet Italian dressing and topped the salad with 1/4 cup of finely diced lean meat and a light sprinkle of shredded mozzarella cheese. I often add sunflower seeds, walnuts, or slivered almonds. The Sweet Italian Salad Dressing is sort of a copy cat recipe of the Olive Garden salad dressing recipe. The important thing here is to find a mix of greens that you enjoy that are packed with vitamins and nutrients, lots of texture and flavor. Chop the greens up finely, mix in a little of your favorite dressing, add a few flavorful toppings and eat more vegetables! Here’s to the new year…here’s to your health! Combine all ingredients. Shake vigorously. Store refrigerated in an air-tight container. We are in the great state of Indiana…all of our roads have been closed by order of the state police. Record breaking low temperatures are on their way. Spent the day shoveling and snow blowing our long drive. Open fields of blowing snow make for white-out conditions. We have the fireplaces going and I brought in lots of food as we had plenty of warning. No school/work tomorrow…we shall see about Tuesday. I’ve been thinking about “the ladies”… Any news? I’m like you, living in a rural area of New Hampshire where the nearest Costco is an hour away. I like how you took a great tasting salad and created your own version. I love the taste of this salad! I am happy to find things that my family loves and are nutritious. Thanks for your comment. Stay warm… I’m sure you have been experiencing some cold and wintery weather!